Synopsis: Wealthy attorney Noel Hawthorne has been found dead in a field, apparently from a hunting accident. His widow Daisy and three sisters April, May, and June approach Nero Wolfe to resolve an issue about his will. He had left his three sisters each a piece of fruit, some money to his widow Daisy, but the bulk of his estate to a Miss Naomi Karn. Daisy is enigmatic, as she wears a veil all the time to cover a disfigured face. The sisters are OK with the fruit, since they are all wealthy in their own right. The issue is that Noel had verbally promised $1M to go to the Science Fund at Varney College, run by sister May. They hire Wolfe to contact Naomi Karn and try to get her to fulfill that promise by donating $1M from her portion. It seems an easy case. Karn is agreeable to the idea. Before it can proceed, police determine Noel's death was murder. Soon after, Karn meets the same fate. 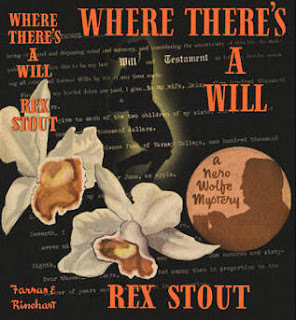 This early Nero Wolfe is enjoyable, with, of course, a quirky family to deal with and hijinks with a will. The operatives working for him are more ready to get into fights than in later books. A vital clue is found when a camera is stolen. Wolfe doesn't find the camera, but discovers the exposed film is no longer in the camera, but is out being processed (remember that routine?). He recovers the photos and one of them solves the case. My copy has a page of the 6 photographs in question bound between 220/221, one of which is a photo of Nero and Archie themselves! A primary source of what they really look like! Readers won't see the clue for what it is, only a Nero Wolfe would see the significance; but the 40's era photos are fun to peruse with a magnifying glass. 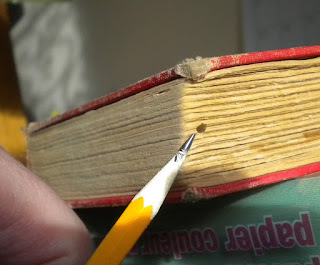 My copy has a bookworm hole where the worm drilled a tunnel into the pages. This is a common happening in books from the wartime 1940's when a high starch content paper was used, tasty for bookworms!